Following a successful Falcon 9 launch-and-barge-landing in California this month, SpaceX is now looking to get back in the swing of regular flight. But while the company’s next two flights seem fairly routine on the surface, they’re going to be historic in one very important aspect. Two upcoming SpaceX launches—a commercial satellite on January 30th, and a commercial resupply mission to the International Space Station in February—will depart from the historic Launch Complex 39A (LC-39A) at Kennedy Space Center. It marks the first use of the pad that sent humans to the Moon since the Space Shuttle era, and the first rockets to fly from Kennedy, period, in over five years. Since the Shuttle program was mothballed in 2011, all rockets launches off Space Coast have flown from the adjacent Cape Canaveral Air Force Station. Built in the 1960s as part of President Kennedy’s Moonshot program, LC-39A is legendary among rocket buffs. It was the site of 12 Saturn V rocket launches during the Apollo era, including the Apollo 11 mission which sent Neil Armstrong, Buzz Aldrin, and Michael Collins to the Moon. After the Apollo program, LC-39A became the de facto launch pad for the Space Shuttle era. A full 80 Shuttle missions departing the Earth from this single piece of beachfront real estate between the early 1980s and the summer of 2011. When the Shuttle program was finally shuttered, LC-39A and Kennedy Space Center at large grew quiet for a few years. But in 2014, NASA granted SpaceX a 20-year exclusive lease to the pad, under an agreement that the rocket company would take over pad operation and maintenance costs. Since then, SpaceX has been busy refurbishing LC-39A for the Falcon 9 rocket and the larger, not-yet-revealed Falcon Heavy model. Originally, SpaceX intended to use LC-39A primarily for crewed launches to the International Space Station, which are expected to start flying in 2018. But when a Falcon 9 rocket exploded just down the road last September, destroying a chunk of Cape Canaveral’s Space Launch Complex 40, plans to re-open Kennedy for spaceflights both crewed and uncrewed were accelerated. There are some key differences between how LC-39A was used in the past and how it will be used in 2017. Previously, the Shuttle was mated to its rocket boosters and external fuel tanks at the Vehicle Assembly Building a few miles away; it was then rolled down the road aboard a Crawler Transporter and loaded onto the launchpad. Now, SpaceX rockets will be processed at a new “Horizontal Processing Facility” constructed adjacent to 39A. 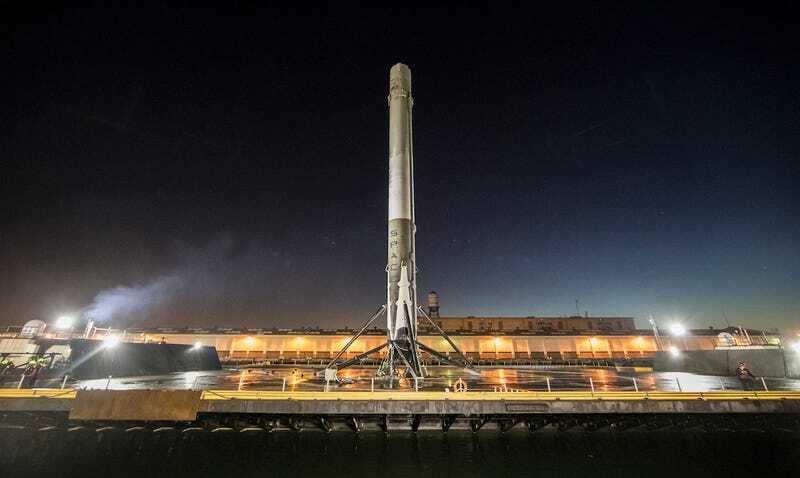 The pad itself has been physically modified to accommodate Falcon 9 and Falcon Heavy rockets, although SpaceX declined to comment on the technical details of the renovations. Are space buffs worried that LC-39A, a priceless legacy of the Moonshot era, will lose some of its historic character as it gets upgraded to accommodate modern rockets? Not exactly. According to Chris Bergin, managing editor for NASASpaceflight, the revival of a LC-39A is being greeted with unadulterated glee by most folks in the spaceflight community. Correction: An earlier version of this post mis-identified the website that Chris Bergin is managing editor for. The text has been updated.